I hate to do it, but I must part with my little race boat. 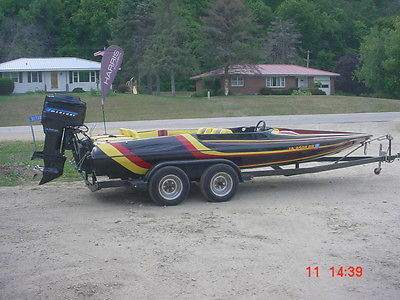 I built this boat in 2010 (my 7th one) from plans I acquired on the Dillon-Racing.com website. There are several classes of racing for these boats up north, but I just used it on a small local lake for fun. The boat is constructed of wood and then covered with 6oz. fiberglass cloth and West System Epoxy resin. You can go to Dillon-racing.com, click on customer projects and click on Don Slomke to see step by step construction photos. The boat is 12' long with a 5' beam and a pad-V hull similar to a bass boat. It will handle up to a 125lb. motor (25-30hp) and up to a 250lb. driver. It is a TON of fun and with 30hp it will run low -mid 40s on GPS. With a racing style prop, they can hit 50mph! 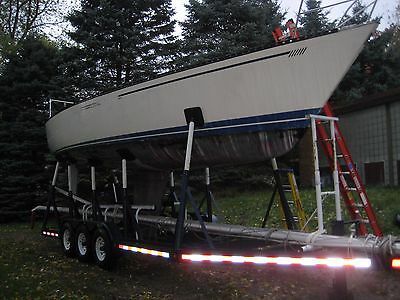 The auction is for the boat, motor & trailer (also a 2010 model). The steering setup, controls, stainless steel prop & fuel tank all go with the boat. The motor is a mid 1980s Mariner 30hp made by Yamaha. This motor has low, low hours on it. I have only put 32 hours on it since I built this boat. It has a new water pump impeller and fresh lower unit lube. I just fired it up today for the first time in 2 years and she fired right up. The boat has fresh paint top & bottom and is ready for the water. It is licensed and titled in WV and I have the clear title in hand. It only weighs about 600 or 700lbs. so you can tow it with just about anything. This boat is designed for use in protected waters and it is the responsibility of the user to assume all liability from its use. This classic Ventnor racing hull with Chevy big block will have you using its trailer winch to pick your chin off from the ground. Very clean, professionally and highly-tuned, she will do over 60 MPH with great ease of control. Touch the throttle and she responds. Overall, this racing machine is immaculate, practically new. Of course it has never touched salt-water and never should. AS OF JULY 2018............. - New Water Pump - New Impellers - New Fluids throughout For the collector or investor or just someone who likes classic racing boats, you can't go wrong with 'Golden Fury II'. **********BUYERS PLEASE NOTE********** Over the winter, she is stored in a heated garage. All hardware removed and wet-sanding performed, then fine-sanding, then new varnish (approx a $10,000 process). 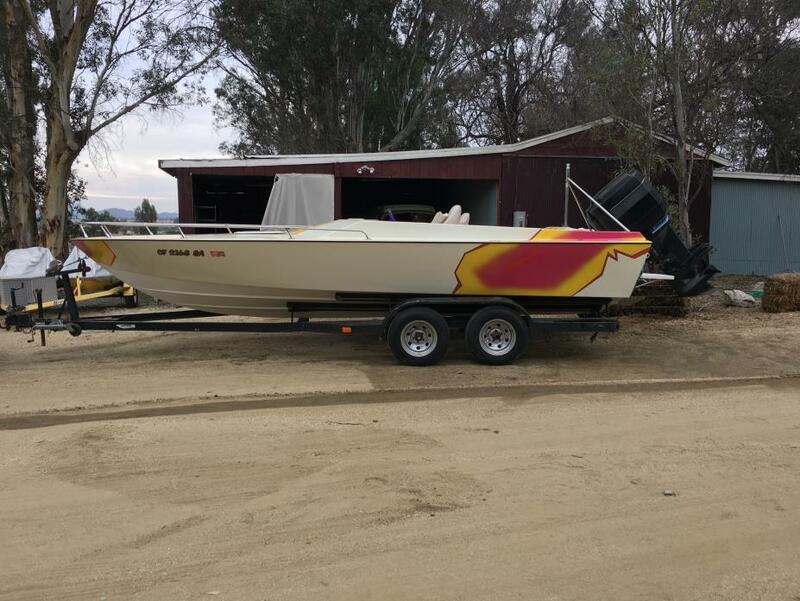 Stock #030887 *** ONE - OF - A - KIND *** FIRST PHOTO SAYS IT ALL *** HAND-MADE, PLANK BY PLANK ** CUSTOM 502 CHEVY, HIGH PERFORMANCE, FRESH-WATER POWER *** If you are in the market for a high performance boat, look no further than this 2002 Ventnor 30 Race Boat, just reduced to $168,000 (offers encouraged). 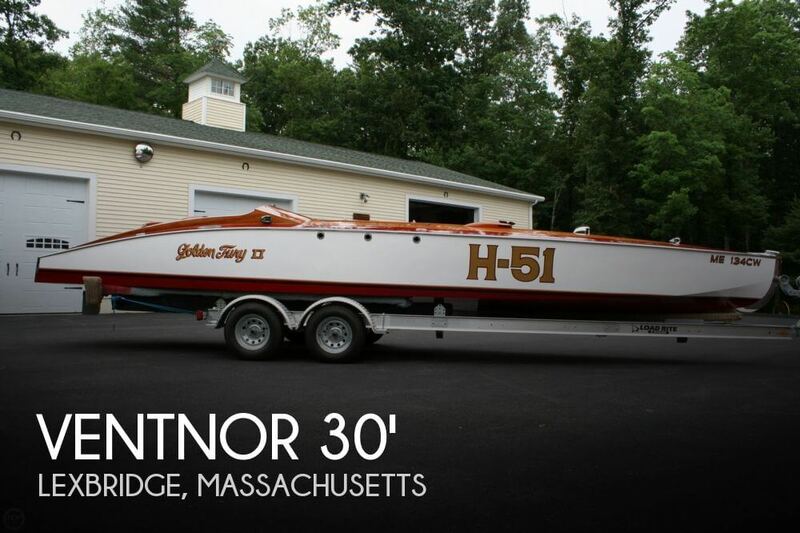 This boat is located in Uxbridge, Massachusetts and is in great condition. She is also equipped with a Custom engine that has only 32 hours. READY TO SELL: BRING an OFFER! 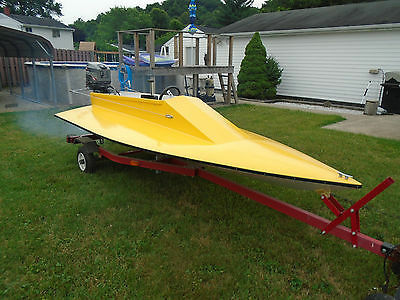 !1997 29' scarab race boat. New custom canopy. 509 CI SuperCat 750 dry sump completely rebuilt. B-max outdrive with stand off box, only a few races on it. 28 inch K planes, hatches re built, new deck paint, ballast. 2010 P3 world champion boat. Located in Sarasota Florida. 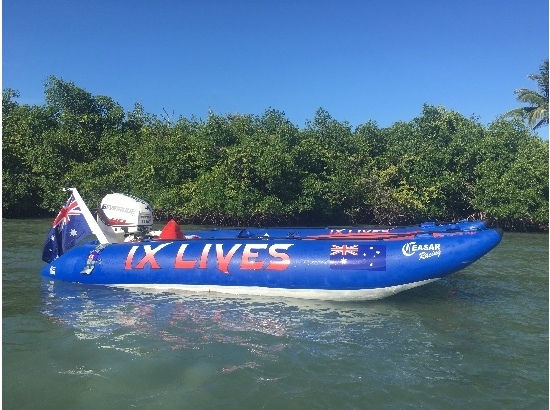 For info call Ed at 941-626-2188 or Jeff at 228-332-0105 BOAT INCLUDES: also includes race helmets, scuba gear. This is a great deal on a solid safe and proven boat. The boat top speed is 95 plus. Trailer is included. According to the Seller: Professionally maintained and serviced, this Skater looks amazing inside and out. Hull looks clean, with no signs of major damage or repairs. The interior is in great shape, all controls are in working order. Stock #166742 WOW! 3200 Horses of Pure Power! Let's Go Racing! Cruise @ 150! 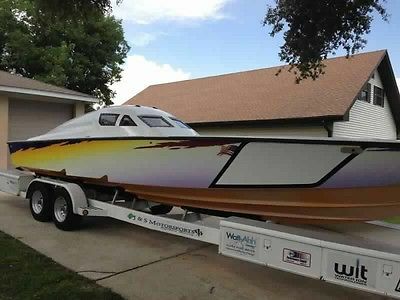 Top Speed 175+ If you are in the market for a high performance boat, look no further than this 2002 Skater 46 Race Pleasure, priced right at $399,000 (offers encouraged). 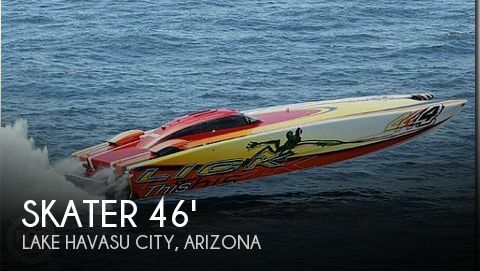 This vessel is located in Lake Havasu City, Arizona and is in great condition. She is also equipped with twin Teague Custom engines. Reason for selling is time to move on. NEW! See this start & run on YouTube, shot on 4/13/15: https://youtu.be/OnKPwAo1K5Q https://youtu.be/7_HJgLaz25U This is a unique, one-off, 30' performance boat. It is in near-perfect condition, powered by a Allison V-1710-63 V-12 Supercharged aircraft engine (FAA certified), government delivery date of July 14, 1942 (not rebuilt, NEW-in-crate government surplus brought out of hibernation to be used in this boat) and with less than 30 hours running time. Behind this V-12 beauty is a custom splitter box, feeding into dual Borg-Warner 72C transmissions with Arneson surface drives & 2 Kiekafer Trim Tabs. Supplementing the powertrain are Aircraft style dual ignitions (either can run alone, or both together),stainless steel headers, Fresh Water Cooling & aluminum water injected exhaust manifolds. 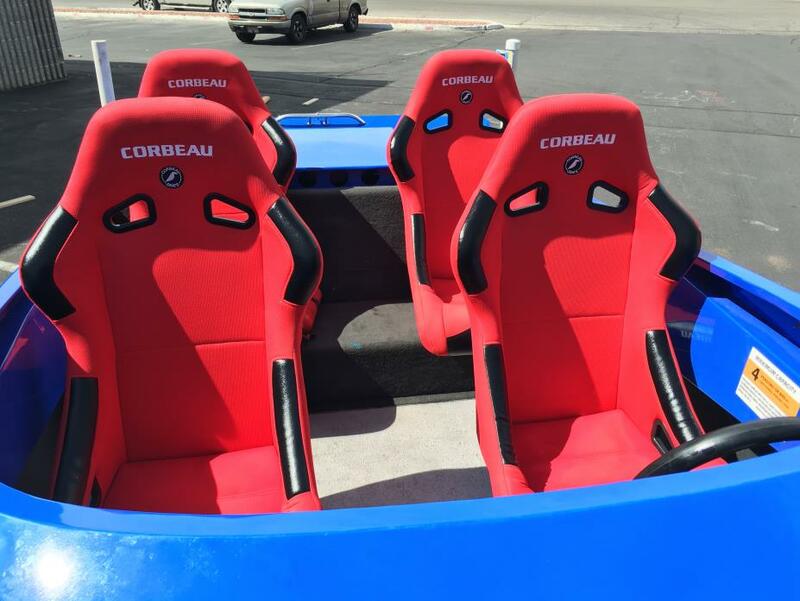 The full custom treatment extends into the interior with rich leather seats & trim (Corinthian? ), full aircraft style instrumentation and a gorgeous dashboard that combines mahogany with machine turned plates. Also included are a cockpit cover, a full length felt-lined travel cover & an Eagle 3 axle trailer, custom-built for this specific boat. The beam is 8', so wide load certification is not required to tow it. We will let this V-12 ROAR to life for serious potential buyers only (now that we have it on YouTube). Nothing half-baked, nothing cheaply done.Everything on this boat was either custom made or tuned by the best in their fields. This is your opportunity to own a unique specialty boat that will turn heads with its looks and get double takes with the V-12 Allison aircraft engine. A lot of questions have been asked about the top speed, which is unknown. What I can say is it certainty should easily go over a 100 MPH and beyond that, how much faster it will go will be up to the next owner. It could be you, make an offer! We may consider offers for the engine or hull alone if the offer is generous enough. And friendly advice for the low ballers, if you can't afford the price, maintenance or (heaven help you) repairs will also be beyond your means. 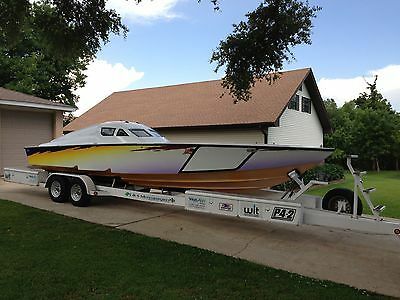 1983 Vaughn Boats Custom Ski Boat 22' Vaughn Ski Boat, 300hp Mercury Outboard runs very strong, Excellent condition in and out, Originally made and used for Catalina to Long Beach Ski Race so great in oceans or lakes, has only been in freshwater for at least 10 years, Seats 5 comfortably, this boat is fast and pulls hard! Call or text Kevin at 951-265-4327 for more info or to set up a test drive! 1978 S&S Tarten Ten in above average condition senior citizen owned. less that 100 actual hours of actual use can be verified. i do have custom built trailer with extender very heavy duty construction and a cradle both trailer and cradle are options to the sale not offered in this post. call 616 874 8235 for details paypal used for deposit only.